What is it you’re buying that takes so long and creates such a thirst that you can’t do it without knocking back a little something in the process? And while we’re at it… why, Ms/Mr Sobeys, do you encourage people to drink while they shop by installing cup holders on your otherwise fine chocolate brown carts? I would have thought it counter-productive. After all, thirsty people will buy more juice and pop and bottles of Clamato. And so forth. Those who are suffonsified will buy less. And so forth. I’m no expert in these things but I’m guessing that if you were to add TV trays, cutlery and condiments to the carts, you would see a significant drop in deli, whole roasted chicken, and possibly other, sales. So I’m advising you against it. Not that you asked. But back to you, Dear Person Who Can’t Shop Without a Drink. For god’s sake, pull yourself together. Surely you can function for twenty minutes without one. And if you can’t do that, then would you please have the courtesy to place your pacifier in the garbage (or better yet, take it home to your recycling bin) and not leave it in the cart for the next person to find… Some of us like to use that space to store our tulips. 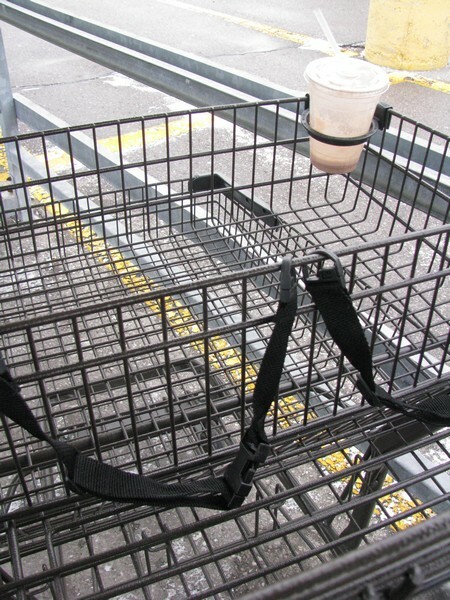 We don’t have cup holders in our shopping carts on PEI (or at least I’ve never seen them). What I have seen in Sobeys (or was it Superstore? ), on a couple of occasions, is half drunk drinks (a bottle of Coke once and I think juice or chocolate milk another time) on food shelves. Thelma and I couldn’t believe it! Somebody walked around with a bottle of Coke, sipping it as they sauntered through the aisles, then decided he or she had had enough and just left it on a shelf. I half suspected that it might be a store employee, but don’t have the proof. Not once, but twice! The cup holder is a new thing here I think. But, isn’t it just typical that The Human has to find the negative application. As for your scenario… if it was an employee you’d think they’d have the smarts to dispose of the evidence. But then I suspect we’re not dealing with three digit IQs. Or even high twos. I just find it a little weird how THIRSTY everyone is all the time. Seems to me people used to function without constantly sipping on something, whether it be water, coffee, whatever. Think it’s a metaphor for something else?